A Digital Death? 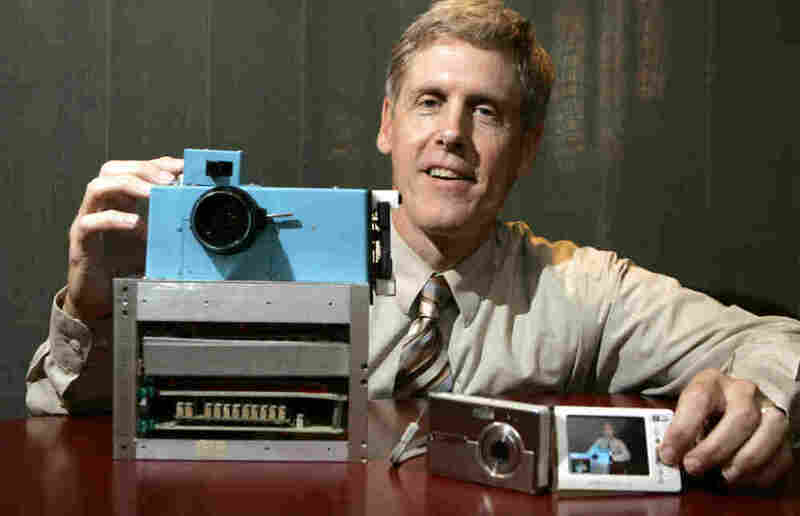 Why Kodak Stopped Clicking Kodak developed the first, 13-pound digital camera in 1975. But it was never really able to capitalize on the product it had invented, and its digital strategy was a bust, analysts say. Now, it's trying to sell thousands of patents for the technology behind digital photography to stave off bankruptcy. The end could soon be near for Kodak, and the iconic film manufacturer may have itself to blame. Kodak, based in Rochester, N.Y., could be headed into bankruptcy over the next few weeks. The company has seen its profits plunge in recent years, largely because of the popularity of digital cameras. Kodak is trying to move into new product lines like inkjet printers, but in the meantime it's attempting to raise cash by selling off some of the patents it's developed over the years. During its heyday, Kodak had one of the most innovative research departments in the world, and in 1975 it developed the digital camera — a product that would eventually be its undoing. "That first digital camera was actually 13 pounds and recorded images on a tape drive, so it wasn't exactly very portable," says Willy Shih, a former Kodak executive who now teaches at Harvard Business School. Over the years, Kodak has tried to jump on the digital bandwagon, making and selling digital cameras and other products of its own. But it was never really able to capitalize on the product it had invented, and its digital strategy was a bust, says Rob Sethre of the consulting firm Photizo. "A lot of it is depending on execution, and it just was not that well-executed," Sethre says. "The results are [that] they're very close to bankruptcy now." In the meantime, the profits it earned from selling film have dried up. Over the past decade, Kodak has lost money almost every year, and the 123-year-old company has had to lay off most of its workforce. But Kodak does have one big thing going for it: It still owns about a thousand patents for the technology behind digital photography. "If you're the first in a field, that is one of those wonderful times from a patent standpoint when you get what is known as a frontier portfolio," says Shih, the former Kodak exec. "In other words, a lot of the fundamental innovations happen early on, and Kodak was in that position, so it filed a lot of fundamental patents." Over the years, as digital photography has taken off, the innovations developed by Kodak have been widely used in smartphones, notebooks and tablets. And Kodak was able to earn a nice profit by licensing its patents to the companies that made them. Now with its cash stream from film sales pretty much evaporated, Kodak has gone even further by trying to sell some of the patents outright. Sethre says the company probably doesn't have a choice. "It's a little bit desperate, although if you have only limited possibilities, it's actually a good and legitimate way to use your corporate assets," he says. So far, Kodak hasn't found a buyer at a price it will accept. Kodak declines to talk about the bankruptcy rumors. As for the attempt to move into new product lines like inkjet printers, it remains a small presence in a competitive field. Mark Zupan, dean of the business school at the University of Rochester, says selling patents is an effort to raise the cash it needs to keep going. But he says the company doesn't have a lot of time left. "It'll give them a year or two," Zupan says. "The fundamental thing, though, is creating product lines that generate sustainable economic growth, and so far they haven't been able to do that at a rate that compensates for how quickly the traditional film business has been declining." If Kodak does go bankrupt, its portfolio of patents could be auctioned off to pay its bills. And for now, investors are pretty skeptical the company can survive. Kodak was once so important it was among the 30 companies in the Dow Jones industrial average. This week, its stock price fell well below a dollar a share, and it could be delisted from the New York Stock Exchange altogether.